This summer Olaf will be thrilled as Walt Disney World celebrates the popularity of “Frozen” in a big way. New entertainment called Frozen Summer Fun LIVE! is coming to Disney’s Hollywood Studios beginning July 5, continuing daily through September 1. Frozen Summer Fun LIVE! will include a variety of “Frozen” themed entertainment including a royal welcome for Anna and Elsa on the Sorcerers Stage (not exactly their official coronation), Frozen sing-along on the Streets of America, “Frozen Funland” in Pixar Place, a dance party with a live band, ice skating rink, ice carving demonstrations, and fireworks show on Hollywood Boulevard. Plus Kristoff will make a first-ever appearance along with ice skaters, skiiers, and hints of Olaf too. Anna and Elsa’s Royal Welcome – Each day at 11 a.m., Anna and Elsa, riding in a horse-drawn sleigh, will travel in a royal procession down Hollywood Boulevard. Rugged mountain man Kristoff is along for the fun joined by a flurry of skaters, skiers and ice cutters, all dressed in their Arendelle best. Wandering Oaken’s Trading Post & Frozen Funland – Inside Soundstage One, there’s a “big summer blowout” happening, where Oaken – the film’s trading post owner – and his cousins have created the “Frozen Funland” amidst a winter wonderland. Living up to its name, there will be plenty of frozen festivities inside the makeshift adventure park Oaken and his cousins built to make the most of the sudden snowstorm. The giant Sorcerer Mickey Hat on Hollywood Blvd. gets the full Frozen treatment with special projections of snow and ice images, in an eye-popping spectacular above Hollywood Blvd. Set to the film’s soundtrack, the fireworks show will feature special guests – including a very magical appearance from Elsa in which she will show how her powers flurry “through the air and to the ground” to produce magically icy blue and white gleaming fireworks. 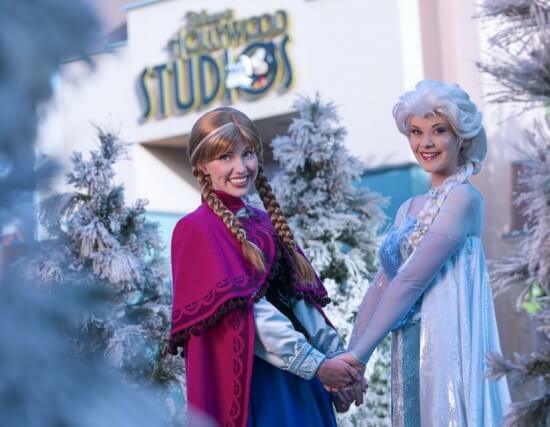 While Anna and Elsa will make appearances as part of the Royal Welcome, “Frozen” Sing-Along, and fireworks show, they will not be meeting with guests at Disney’s Hollywood Studios. That happens over at Princess Fairytale Hall in the Magic Kingdom. Likewise, Olaf will make “appearances” via video screens and in audio announcements but will not be available as a character to meet. FastPass+ will not be available for any of the new Frozen Summer Fun experiences. Hmmm… this sounds like fun, but how are people supposed to fit it into their schedule? July 5th is only about a week away. I’m sure anyone planning to be there during that time (of which I am one 🙂 ) have their plans set via MyMagic+. I know my family and I are supposed to be in Epcot that day, at least for the AM. Hopefully, it’s not a one day event. We’ll be in HS on July 6th, and, like everyone else, my girls go nuts for all things Frozen. I’m sure they’d love this. It goes until September 1st. If it’s at Hollywood Studios then this will not be their long awaited coronation; that will take place in Magic Kingdom like all the others when it happens. Only Merida’s coronation ceremony has been at the Magic Kingdom. Tiana’s was in New York (though she did get a “welcome” ceremony at the Magic Kingdom). Rapunzel’s coronation was in London. I just checked the app at 11:50 am and they must have removed it as an option. Or I am doing something wrong, possible. It was removed. Seems like it wasn’t ready to be revealed just yet. I checked too and it’s not there. Nooo. Beauty and the Beast is amazing. They’ve already begun to shut down Indiana Jones, American Idol experience, and Lights, Motors, Action! If they got rid of Beauty and the Beast… I think they’d loose a lot of fans. It’s a classic, and WAY too any people see it every day to get rid of it. And Frozen is just… No. That’s too big a gamble. People either love it or hate it. But everyone pretty much enjoys the classics. It’s not in the beauty and the beast theatre. They’re already taking out American Idol. They should put it there. It’s right in the center of the park, it’s inside so you can actually make it colder if needed, and the stage is already set up. Make some tweaks and it could be good to go by next Summer. The Beauty and the Beast show is probably the most consistently filled event other than Fantasmic. It one of the fastest Fastpass plus events to fill up after Fantasmic and Toy Story Mania. The popularity also increased after Fantasyland opened up so it’s not worth getting rid of it. I’m not going to WDW until December. They need to discover how popular this is (will be) and extend it (at least through the holidays)!!! We’d love to see it all but can only do the one trip, our first. Believe me, this will do nothing. All the attention will still be on Diagon alley. They should never have put in Diagon Alley, because it killed JAWS. I’d rather keep an original classic attraction than expand HP. But the popularity was waning. I agree because I loved the ride, but the movie is not as relevant as it once was. I think they should have at least done an overhaul of the ride, maybe even have put in in a building similar to Pirates so that they could control lighting and enhance the scariness factor. Still miss it but Diagon Alley is going to be ridiculous. Hoping there is some sort of Frozen activity or character dinner in December. We leave for DW the day after Christmas. Special Bday and gretuatiom surprise for our girls. We love Frozen!!! Yes. Looks like it starts July 5th, and continues daily through September 1st. My family and I will be there through the 7th. Any idea when that fastpass will be back and if it is a tier 1 or tier 2, Ricky? Other articles (including the one on Disney’s Parks Blog) have said that Fastpass+ won’t be available for any of the Frozen offerings. Just switched out my WDW vacation next week for August! I must do all of this! !!!! Disney had to do something to try and draw attention away from the new Harry Potter attraction at Universal. And this is definitely not going to work. At all. Universal is dead without JAWS, Back to the Future: The Ride, Nickelodeon Studios, and Kongfrontation. Even with out Harry Potter i think this would happen. The demand for everything Frozen is huge. We dont have to pay for the Frozen fun party (except admission to HS)?